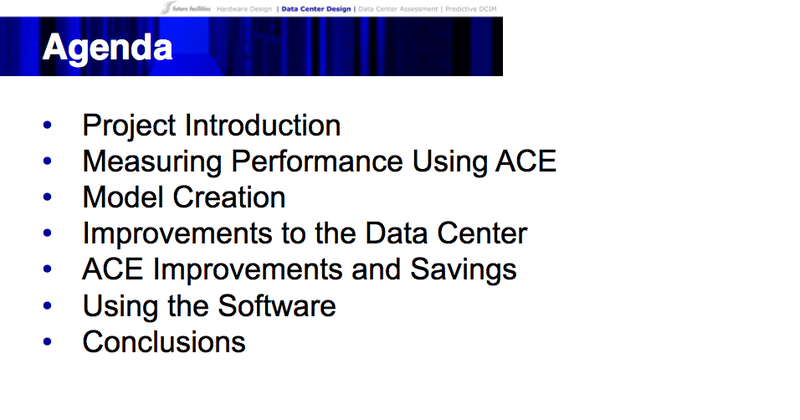 This presentation will outline a series of steps that enabled the bank’s data center to best analyze and enhance data center performance. During his discussion, Mr. Pastrana will explore how a global financial institution used a predictive approach in their operations to increase efficiency, resilience and to maximize useable data center capacity in their facility. By building and calibrating a Virtual Facility for their data center, the bank’s facility was able to undertake a project that resulted in significant energy savings and an increase in usable capacity. In addition to its featured discussion, Future Facilities will also be exhibiting at Data Center Dynamics, Booth #43. For those not able to attend the event, you can visit www.futurefacilities.com/media/info.php?id=240 to download the case study. This entry was posted in Data Center DCIM Datacenter Datacenters Datacentre and tagged 6sigmaDC, capacity, CFD, christian pastrana, continuous modeling, Continuous Modeling for DCIM, data center, data center capacity, data center infrastructure management, Data Centre, Datacenter, Datacenter Dynamics, Datacenter Dynamics New York, datacenters, datacentre, DCDNY, DCIM, future facilities, Predictive DCIM, simulation, Virtual Facility. Bookmark the permalink.